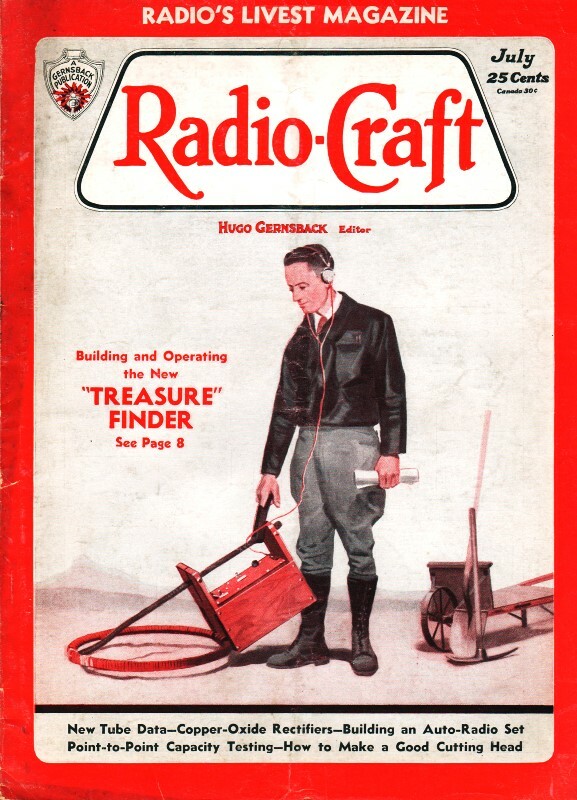 Here is General Electric Model K-40-A Radio Service Data Sheet as featured in a 1933 edition of Radio-Craft magazine. As mentioned many times in the past, I post these online for the benefit of hobbyists looking for information to assist in repairing or restoring vintage communication equipment. *Impossible to measure on ordinary voltmeter; on 25 cycles the voltages will be lower than those on 60 cycles. Voltages are measured to cathode. 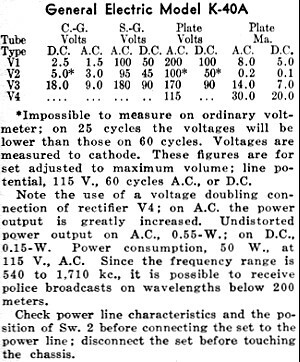 These figures are for set adjusted to maximum volume; line potential, 115 V., 60 cycles A.C., or D.C. Note the use of a voltage doubling connection of rectifier V4; on A.C. the power output is greatly increased. Undistorted power output on A.C., 0.55-W.; on D.C., 0.15-W. Power consumption, 50 W, at 115 V, A.C. Since the frequency range is 540 to 1,710 kc., it is possible to receive police broadcasts on wavelengths below 200 meters. Check power line characteristics and the position of Sw. 2 before connecting the set to the power line; disconnect the set before touching the chassis.